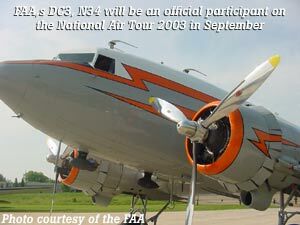 MINNEAPOLIS (July 15, 2003)  The last DC3 operated by the Federal Aviation Administration, N34, will be the newest, fastest and largest transport of the official participants taking part in the National Air Tour 2003 this September. The Tour re-creates the National Air Tours that took place from 1925 through 1931 to convince a skeptical public that air transportation was the safe, reliable and modern way to travel. The Aviation Foundation of America, an official partner of the U.S. Centennial of Flight Commission, has organized the centennial version of these pioneering, historic aviation events. An FAA crew will fly the 58-year-old DC3 on the 2003 Tour, alongside more than 25 other historic Tour aircraft, joining in the Centennial of Flight celebration. N34 will represent the FAAs integral, 77-year role in operating the safest, most efficient airspace in the world. The aircraft is painted in the colors of the Civil Aeronautics Administration (a predecessor to the FAA) and is outfitted just as it was when it was one of 60 DC3s in the agencys flight inspection fleet. The original National Air Tours, N34, the FAA and its predecessors have played critical roles in promoting and building a safe and reliable system of air transportation in the United States. The National Air Tours were conceived by a group of air-minded Detroit businessmen in the 1920s, including Edsel and Henry Ford, to demonstrate the safety and reliability of civil aviation, while promoting the development of aviation design, manufacture and infrastructure. Building on this aviation heritage, N34 was operated by the FAA from the mid-1950s to the mid-1980s as one of 60 DC3s in their flight inspection fleet that checked the accuracy of navigational aids in the National Airspace System. Modern jets and turboprops perform that function now  but the principle and the tasks are the same as they were when N34 and her sisters flew the missions. More DC3s were produced than any other transport airplane in American history. Its design, versatility and dependability rank it among some of the most popular aircraft ever built. Although N34 was one of the last of more than 10,000 DC3s produced between 1935 and 1945 on three continents, hundreds of DC3s are still in service today, used by military, commercial and private pilots around the world. Beginning on Sept. 8 in Dearborn, Mich., the National Air Tour 2003 will visit 26 cities on a 4,000-mile route during a 17-day period, weather permitting. In addition to the FAAs DC3, official aircraft on the Tour will include at least three Ford Tri-motors, flying boats and other vintage aircraft rarities. The National Air Tour will bring aviation history to people along the route, through the media and over the Internet at NationalAirTour.org. The Tour is expected to return to Dearborn on Sept. 24. N34 was built at the Douglas Aircraft plant at Tinker Air Force Base in Oklahoma City and was delivered to the Navy as an R4D-7 in May, 1945. It was put into Navy service as a transport serving U.S. embassies in such far-away locations as Rome, Naples, Paris, Algiers, Oslo, Cairo and many others. 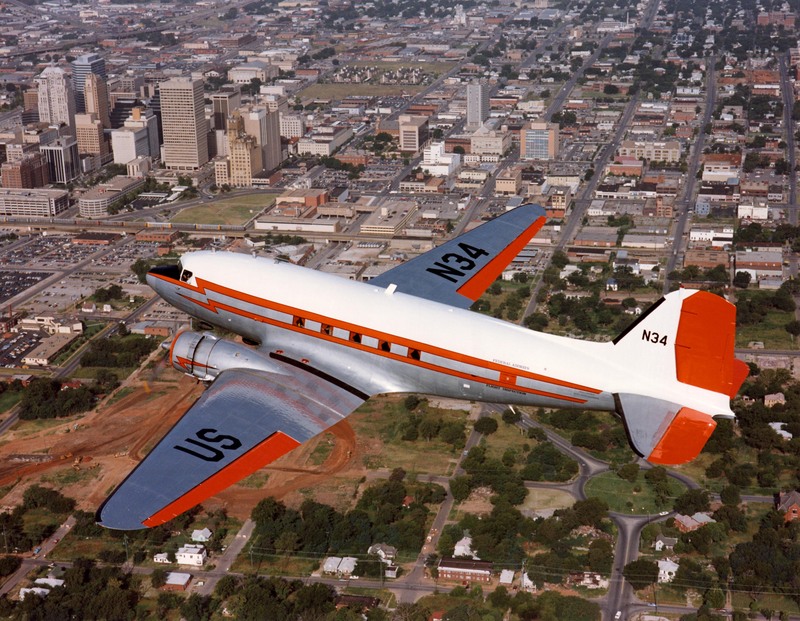 In 1963, the aircraft was transferred to the Federal Aviation Agency (a predecessor to the FAA) along with other DC3s to check the accuracy of navigational aids. 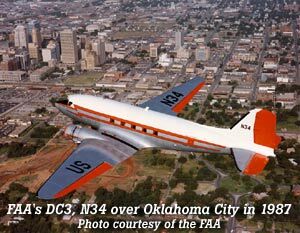 Following its service, N34 was put to work as a goodwill ambassador, an educational resource and a visible reminder of the FAAs role as it appeared at air shows and events around the country. In 1993, N34 was taken out of service and stored in Hangar 10 at Mike Monroney Aeronautical Center at Oklahoma Citys airport, awaiting transfer to a museum. This year, N34 is making a farewell tour for the FAA. It will start at Washington National Airport in early July following a ceremony marking its return to service; to Dayton, Ohio, for Inventing Flight, July 3-20; to Oshkosh, Wis., for EAA AirVenture 2003, July 29Aug. 4; and, around the country for the National Air Tour 2003 in September. N34 will visit other events during the fall and will be present at the December 17 ceremonies at Kitty Hawk, N.C., marking the official centennial of Wilbur and Orville Wrights first flights. Minneapolis-based Aviation Foundation of America is a 501(c)3 public charity designed to preserve and promote Americas aviation heritage at a grassroots level through initiatives such as historic flight re-creations, airport preservation projects and educational programs. The Aviation Foundation of America is an official partner in the U.S. Centennial of Flight Commission along with the FAA, NASA and the Experimental Aircraft Association. For additional information about the National Air Tour 2003, visit www.NationalAirTour.org. EDITORS NOTE: For a downloadable photo of N34 and a complete schedule of Tour stops, visit the media center at www.NationalAirTour.org.